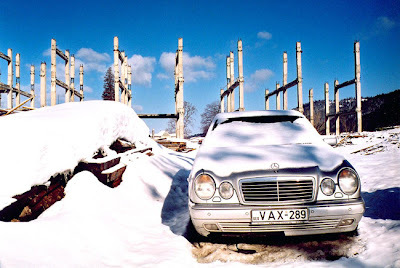 Bakuriani Ski Resort - The brand-new Mercedes and the construction site of a new hotel gives away the whole game, really. But this is basically still just a pretty, sleepy village high up in the [Lesser] Caucasus mountains. 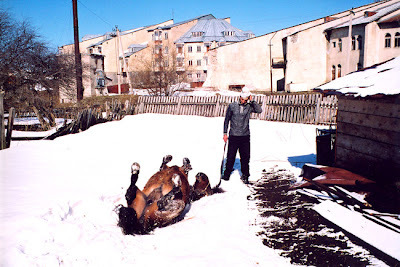 Edo Khatchaturianshvili's horse Tarzan rolls himself in the fresh snow in Bakuriani; I went riding with him for a day, and he suggested we go to an Ossete village a few kilometres away. His surname is very interesting, and speaks volumes about the fact that many, many different peoples inhabit the Caucasus and Transcaucasus: The suffix "-shvili" means "child of" in Georgian, and "-ian" is its Armenian equivalent; so Edo "[Georgian] Son of [Armenian] Son of Khatchatur, an interesting combination. Edo and Tarzan again (I was riding on Manan). 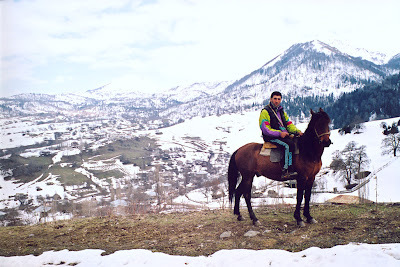 The village in the background is called Didi ["big"] Mitarbi; it is still an Ossete village, so populated by a people completely and utterly different from the Georgians. (The Ossetes are an Iranian people; the descendants of the Scythans, Sarmatians, and Alans, their language is in the same family as Pashtun, spoken in Pakistan and Afghanistan.) Initially home to forty or fifty families, most of them fled in 1991 when fighting broke out between Georgians and Ossetes, and moved to the separatist region of South Ossetia and its self-proclaimed capital, Tskhinvali. Almost all the houses stand empty now, and only 30 people still live in Didi Mitarbi. 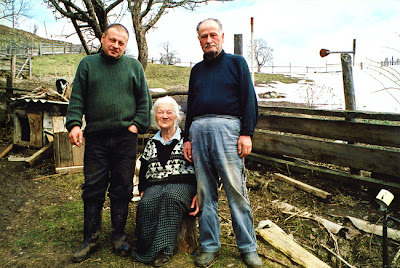 Some of the Ossetes who stayed: Vazha, his mother Elena, and Viktor. Vazha and Viktor know only a few words of Ossete, and I doubt they could have a real conversation in that language. "Hello" or "good-day" in Ossete sounds like "bai-riai dabonkhors"; "please", "tugeneni"; "thank you", "buznek"; and "good-bye", "khorzai bazai". Vazha's mother Elena still speaks Ossete, and with her help I was able to collect thirty or so words, and record a few minutes of her speaking. They were extremely kind to me, inviting Edo and I to stay for lunch in their old house, plying us with their food and drink, very keen to entertain the ethnolinguistic fancies of the strange foreigner from Belgium, and all I could leave as thanks for their welcome was some "German" ham, which they were surprisingly keen on. 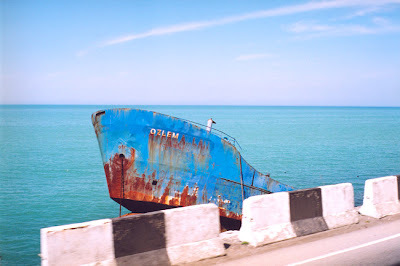 A Shipwreck named "Desire" (in Turkish), along the coastal road near Batumi, on the Black Sea. Apparently, this particular stretch of road is notorious for car accidents, drunk drivers careering out of the curve into the sea. It is the only curve for miles, and people do drink a lot around here, so it's not so surprising perhaps. 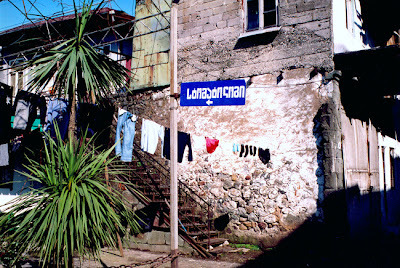 A view of old Batumi. 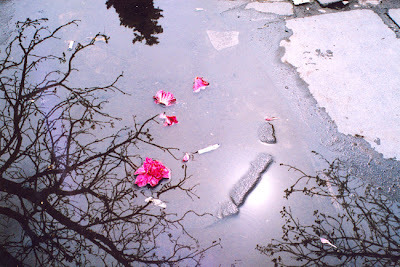 Nothing much is happening in this picture, but I quite like it nonetheless. In case you're wondering, the sign reads "stomatology". And last of this series, and equally insignificant, is the first colour picture I had taken for a very long time. The colour of the flowers obviously caught my eye, but the trees are still very much me "thinking in black and white" (whatever that really means).